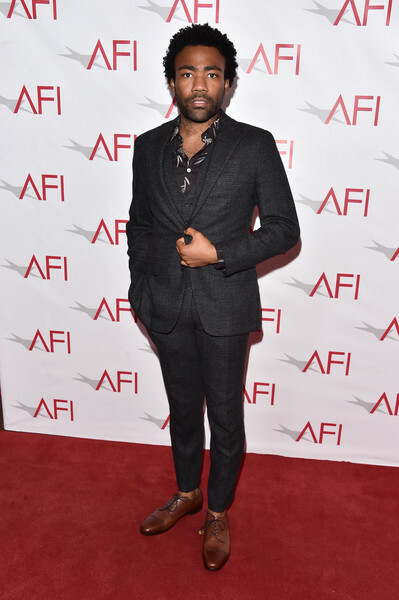 More pre-Emmy gaming at the Vanity Fair and FX party with a whole host of TV Ate My Wardrobe faves and this party also showcases just how good FX is at the moment. 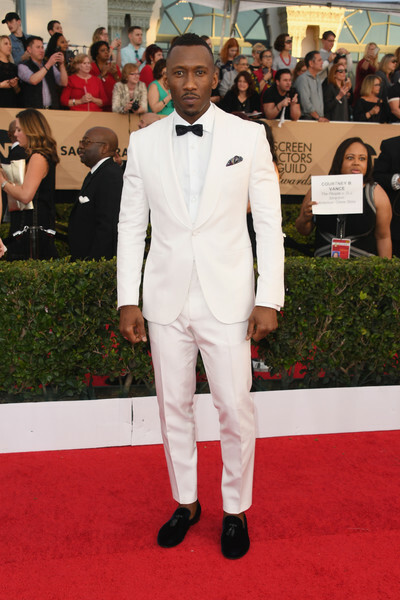 Plus the annual BAFTA LA Tea Party, which always delivers on the daytime shindig attire. 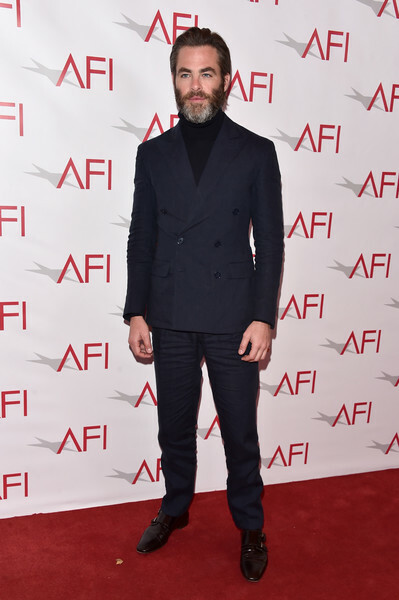 Got to kick off with the show that dominates a lot of costume chat in these parts; Keri Russell always brings the casual glam to events like this and for this occasion Matthew Rhys has dialed back on the hiatus beard grizzle with a trim. 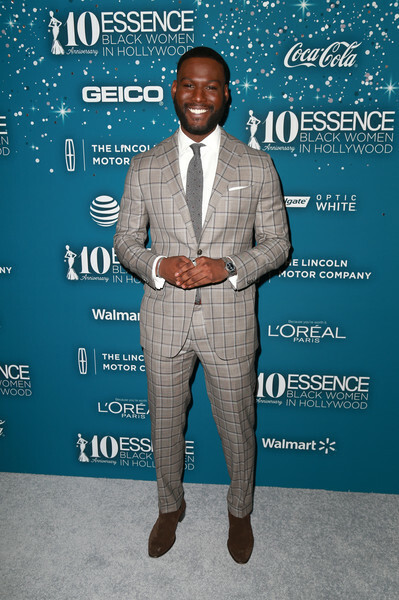 Nice color suit too and I am looking forward to seeing more of this IRL couple tonight. 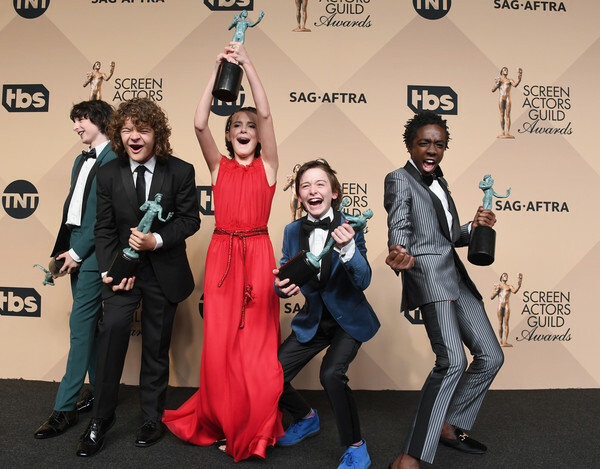 And this is several shades of adorable from the Americans kids and Keidrich Sellati’s turtleneck/blazer combo is levels of spy and casual attire that his TV dad would wear. 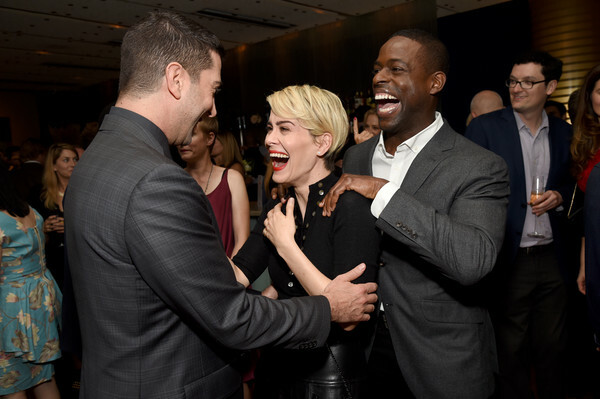 Delightful is the word I would use to describe this photo with the cast of American Crime Story giving off all the good vibes. Excellent lipstick choice from Sarah Paulson too. 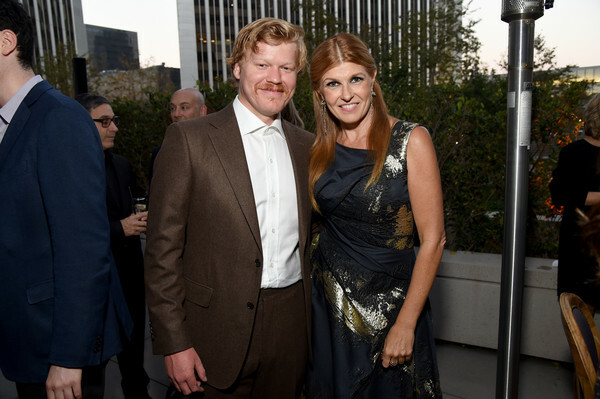 This Vanity Fair/FX party is just a long list of feelings pretty much; including this Friday Night Lights reunion. Tami and Lance feeeeeeelings. 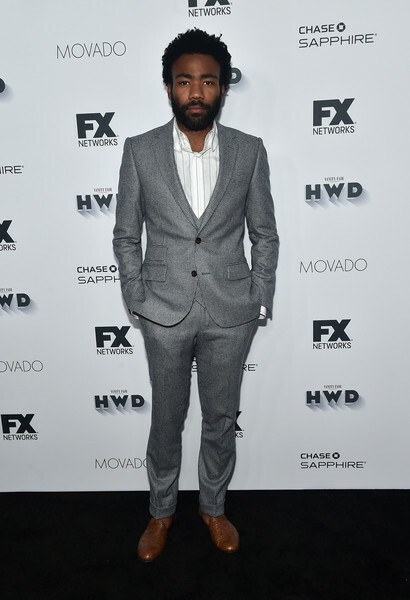 Donald Glover keeps the same shirt and changes the suit and still looks just as good as the day before. Angela Bassett always looks incredible and this is no exception. 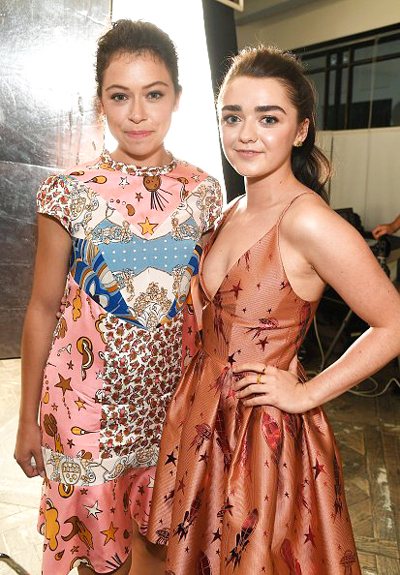 Now to the BAFTA LA Tea Party and there are a lot of super cute patterned dresses to scroll through including Maisie Williams in a very fun House of Holland number, which pairs really well with Tatiana Maslany’s also starry patchwork Coach frock. 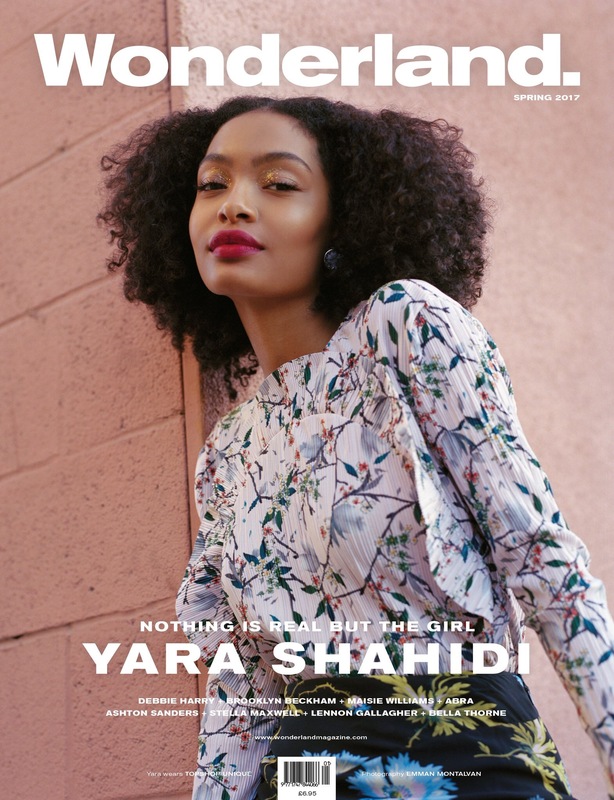 Going slightly more pattern delicate is Yara Shahidi in an ethereal Tommy Hilfiger dress and another stunner from the Black-ish star. 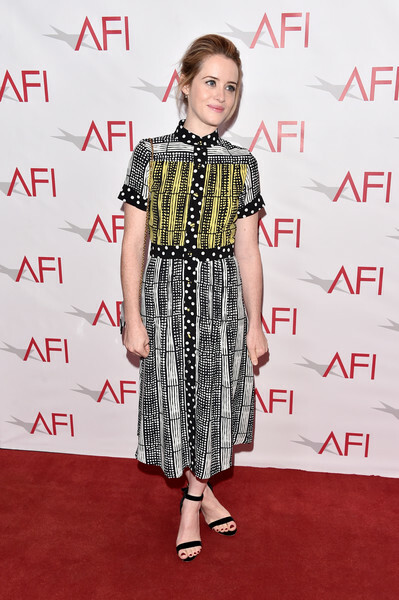 A few days ago I mentioned some red carpet similarities between Millie Bobby Brown and Kiernan Shipka; this look continues this notion and while I’m not a fan of the term ‘age appropriate’ (as it can sound quite stuffy) this is exactly that. Good choice of flats too. 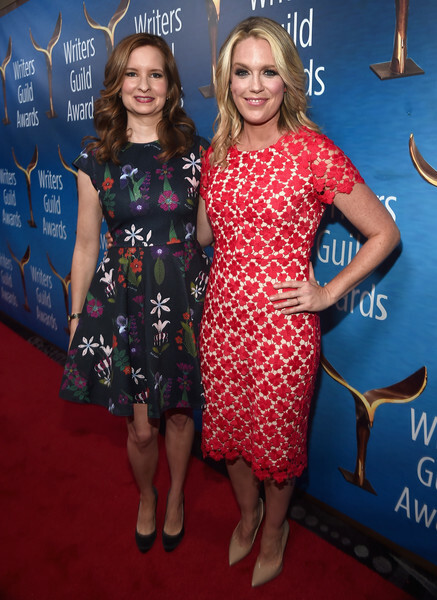 Transparent’s Melora Hardin also has the right idea for a frock that bridges the summer/fall gap especially when it is still this warm. 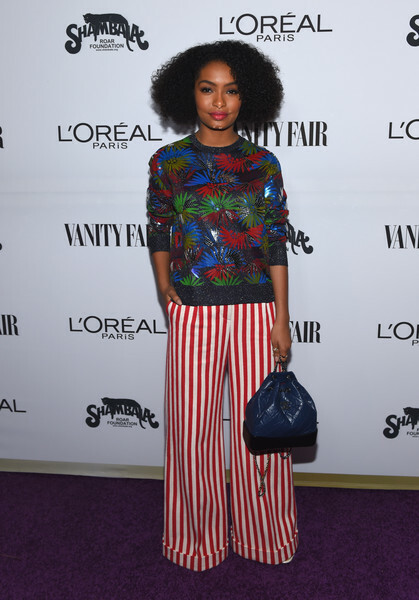 A different spin on print and Alison Wright’s Stella McCartney jumpsuit (the top version has been worn by Cookie on Empire) is a fun take on daytime party attire. 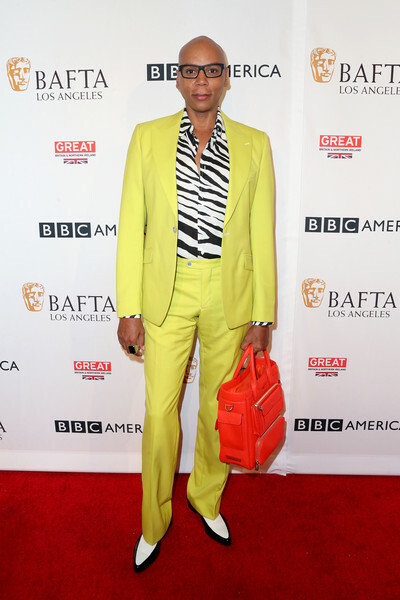 Polka dots and pink at the Creative Arts Emmy Awards, zebra print and yellow at the BAFTA Tea Party; RuPaul crushes it in color and print every single time. A very quiet week on Instagram on the TV work front because of Memorial Day weekend. This also means there have been plenty of celebs at the beach/hanging in the sunshine photos splashed across Insta of which we have a couple, but the majority of this week is dedicated to co-star hangouts and cute outfits. 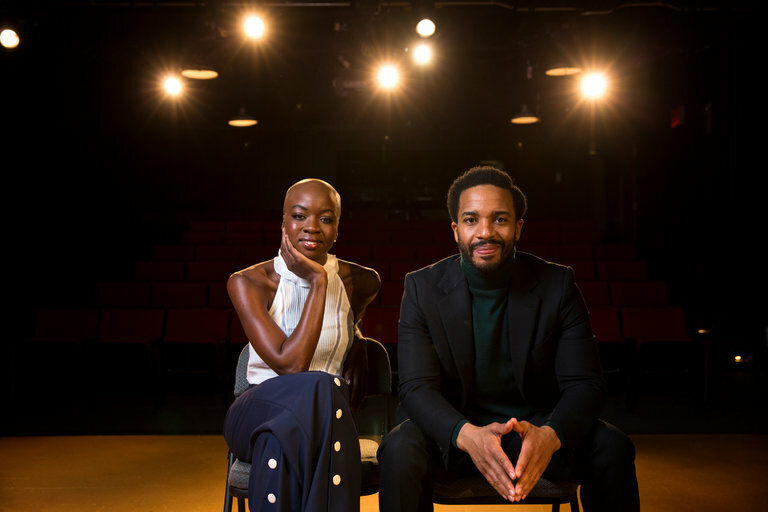 Norman Reedus went to see Eclipsed and this ticks all my supporting a co-star in their other endeavors boxes. Plus a whole lot of patterned outfit delights. Continuing with this theme and a much more loving/supportive version of this relationship than the one we saw on Orange is the New Black. More from the OITNB ladies and they’re celebrating Laverne Cox’s birthday, which also ticks those co-stars who hang out boxes. Plus it is just over two weeks until OITNB returns (Friday, June 17). So this is not from this week, but as I just caught up with iZombie I have some new Insta accounts to peruse and this is just too wonderful not to include. Robert Buckley in glasses is a really good look. 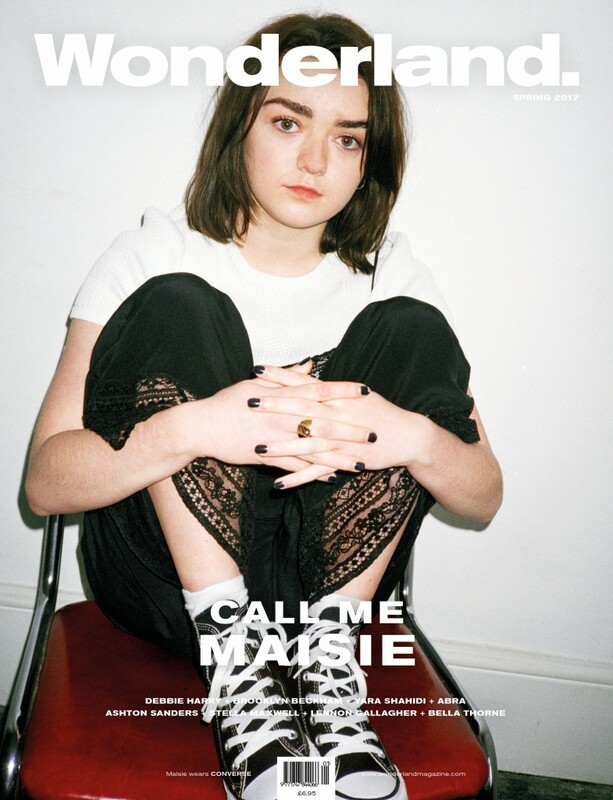 Maisie Williams is giving me so many flashbacks to my first festival going summer way back when as the 90s continues to dominate. Whenever I see anyone with star earrings like this it makes me regret my non-pierced lobes. Keeping with the 90s and Game of Thrones trend with Emilia Clarke getting particularly giddy on The Graham Norton Show. Cute Outfit: Part 1 with a side order of whoa that shoe closet. Well, @samanthapleet has another total win on her record w this cute number! It's a mini dress! It has Windows and plants and ghosts and big huge pockets! 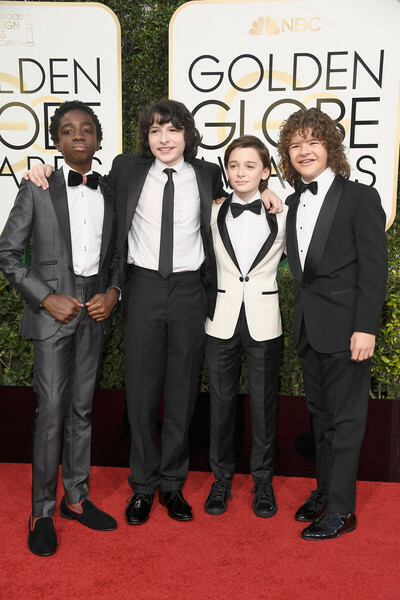 What the hell is cuter than tiny khakis?? When I see Goldie Hawn in swimwear all I can think of is Overboard as no one does swimwear quite like Goldie in this movie. Cannes kicks off this week and jury member Kirsten Dunst is already slaying all over the place in both casual and evening wear. 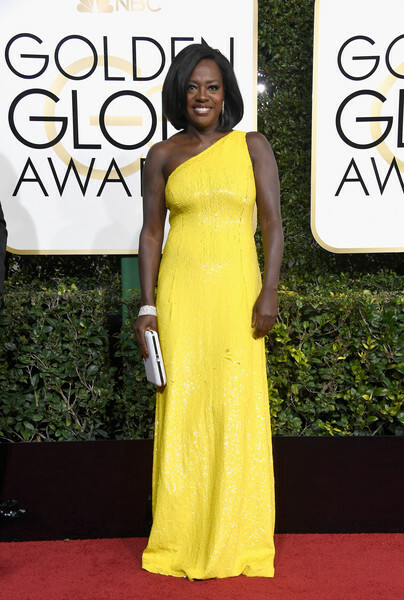 There is a whole yellow theme this week and we’ve got great BAFTA style. Plus some bonus runway joy. Everything about this Kirsten Dunst Cannes Jury photocall look is perfection right down to the wedges, but really the yellow Dior (yes Dior can pull a stunner out the hat still) dress and the red lipstick is what has me going full heart eyes emoji. It is also giving me flashes of The Two Faces of January; a movie I watched on a plane and I enjoyed for all things Dunst, Oscar Isaac and the A+ costume design. And for the evening Kiki goes for ethereal floral beauty in pink and red Gucci. As with Claire Danes, my love for Dunst goes way back to my teens with things like The Virgin Suicides and I am so excited to see what other delights she will have on offer over the festival. 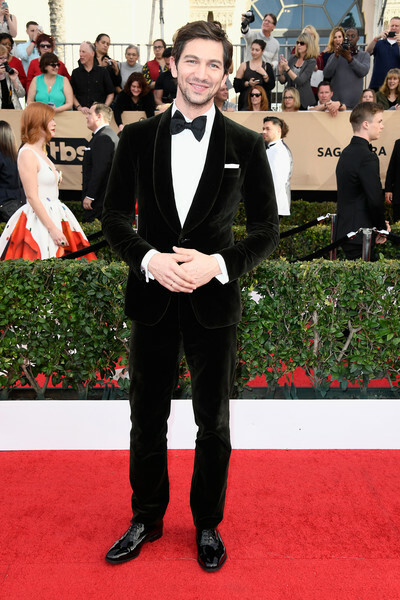 Mads Mikkelsen is also on the jury and he has every right to look this pleased with himself as he is a tuxedo wearing dreamboat. 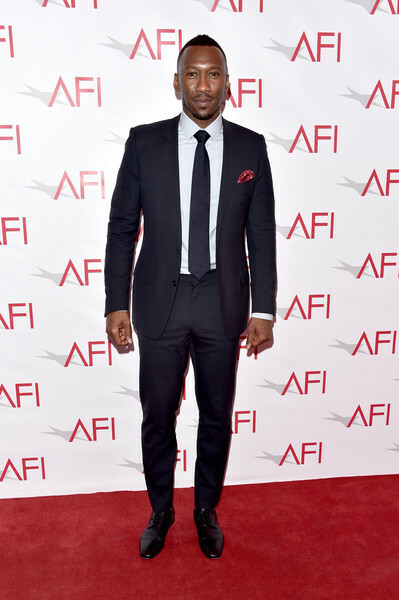 This helps fill in the very big hole left by Hannibal in terms of men’s style and Mads. More yellow thrills from Cannes with Anna Kendrick hitting up the Cafe Society premiere in a bold Stella McCartney gown. We said goodbye to Cush Jumbo’s Lucca Quinn this week and I cannot wait to see what she does next. For now here is Jumbo at the BAFTA TV Awards in gold Michael Kors and she looks incredible. 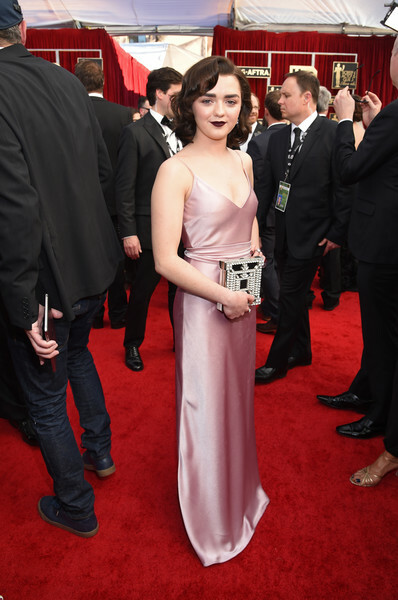 Maisie Williams is pretty in sparkly metallic pink at the BAFTAs and this Antonio Berardi mini dress continues Williams’ funky red carpet hot streak. 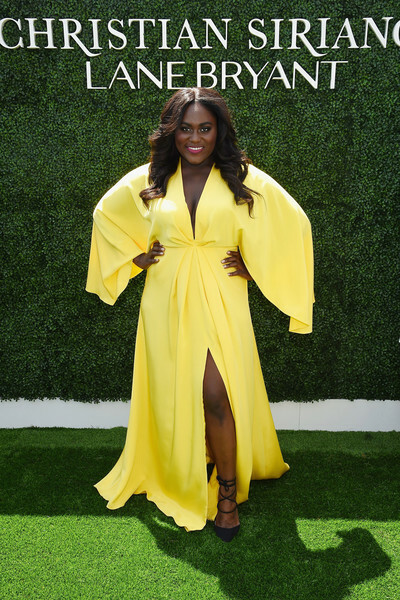 Ending this week’s yellow infused “Out of the Box” with Danielle Brooks walking the runway for Christian Siriano’s new Lane Bryant plus-size collection. The rooftop event showcased the collection, the city and the models in the most fabulous way. If only all runway events were this fun. Also this week saw the release of a new Orange is the New Black trailer ahead of its premiere next month and tension levels at Litchfield look set to increase. This is what I was trying to watch on Wednesday when my internet went kaput so now is a very good time to give a shout out to my friend Tony for taking pity on me and letting me set up shop in his front room so I can do some work (and watch things like this). Fingers crossed by Monday all normal service will resume.